Problem: Chinese Android tablet hangs on boot. Android logo appears and then freezes. It shuts down after few seconds. Reason: The Android installation is corrupted. Solution: Reflash / install a new android firmware / OS. 3. While the tablet is off, insert the card to the card reader /slot at the bottom of your tablet. 4. Turn it on and wait for instructions. It will say when to remove the memory card. 5. The unit will turn off. Turn it on again. That's it. You should see the Android logo by now and wait for it to boot. If the unit won't turn on after flashing, it means that you used the wrong firmware. Download other firmware for your Android Tablet. In some system, Local Area Connection (LAN) says the cable is unplugged even though it is plugged in. Properties shows: "Windows cannot start this hardware device because its configuration information (in the registry) is incomplete or damaged. (Code 19) Click Troubleshoot to start the troubleshooter for this device." You cannot uninstall the AVG miniport driver entries (remove or delete). Update and rollback doesn't work either. System Restore will not help. Uninstall your network adapter (the one without exclamation mark) and install it again. This usually solves the internet connection issue but the AVG miniport driver entries still exists. Go to Network Connections and disabled then re-enabled Firewall protection for your network connection. Download and use AVG remover. It is a cleanup utility provided by AVG to remove any trace of AVG antivirus. 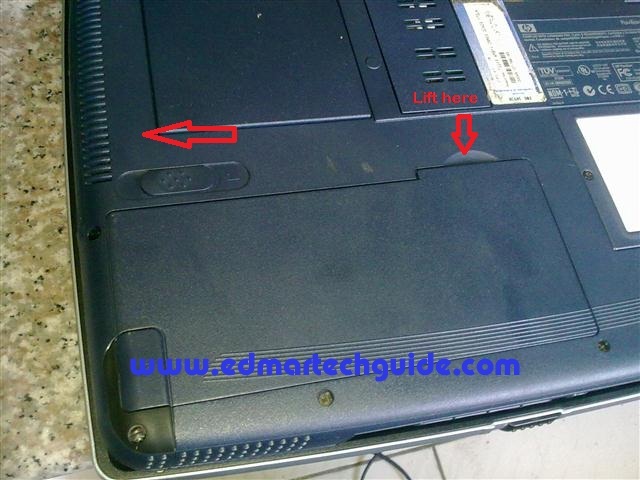 This is a common problem for laptops bought in Japan. Japanese laptop = Japanese OS. If you want to convert it to English operating system, you will face a very common problem after converting. Reason: Windows Vista and Windows 7 somehow identifies some Japanese keyboards as an English device. Solution: You will need to go to the Registry and tell Windows that you have the standard 106/109 Japanese keyboard instead of the English 101 version. , type regedit in the Start Search box, and then click regedit in thePrograms list. Right-click LayerDriver JPN, and then click Modify. Note If the LayerDriver JPN registry entry does not exist, create it. To do this, right-click a blank area in the details pane, point to New, and then click String Value. Then, typeLayerDriver JPN to name the new string value. In the Value data box, delete the existing value, type kbd106.dll, and then click OK.
Right-click OverrideKeyboardIdentifier, and then click Modify. Note If the OverrideKeyboardIdentifier registry entry does not exist, create it. To do this, right-click a blank area in the details pane, point to New, and then click String Value. Then, type OverrideKeyboardIdentifier to name the new string value. In the Value data box, delete the existing value, type PCAT_106KEY, and then clickOK. Right-click OverrideKeyboardSubtype, and then click Modify. Note If the OverrideKeyboardSubtype registry entry does not exist, create it. To do this, right-click a blank area in the details pane, point to New, and then click DWORD (32-bit) Value. Then, type OverrideKeyboardSubtype to name the new DWORD value. In the Value data box, delete the existing value, type 2, and then click OK.
Right-click OverrideKeyboardType, and then click Modify. Note If the OverrideKeyboardType registry entry does not exist, create it. To do this, right-click a blank area in the details pane, point to New, and then click DWORD (32-bit) Value. Then, type OverrideKeyboardType to name the new DWORD value. In the Value data box, delete the existing value, type 7, and then click OK.
Exit Registry Editor. Then, restart the computer. I recently changed my WiFi router password due to security and the next time I use my Nokia 5800Xm to browse the internet, it won't let me connect to my router. The reason is the stored password on my phone. Nokia 5800 doesn't offer you to enter a new password if the stored password ('known") don't work. Now double-click on the WiFi connection name that you would like to edit. Double-click Pre-shared key and input the new password for your WiFi connection. If you're using the regular Mozilla Firefox, importing your bookmarks, saved passwords and browsing history into Google Chrome is a breeze. Unfortunately for Firefox portable user, Google Chrome doesn't recognize it as an import source. Here's a step-by-step guide on how you can import Mozilla Firefox Portable into Google Chrome in your Windows 7 machine (and possibly Win Vista). 1) Close any instances of Mozilla Firefox (portable). 2) Download and install the regular version of Mozilla Firefox. Get it here. 3) Launch the newly installed Firefox and close it. 5) Inside you will see a folder: something like 7raursp4.default. Open this folder and delete all files and folder inside it. *Note: \Firefox Portable Folder\ varies depending on the installation folder you use when you first install it. Select all folders and files inside profile folder. Copy it and paste it to the 7raursp4.default folder you open up earlier. 7) Open up Google Chrome. 8) Click on the wrench icon at the upper right portion of Chrome and select Options. 9) Under Personal Stuff tab, click import data from another browser. 10) Click import and that's it. A typical Windows 7 install requires at least 16GB of free storage space, thus making it pretty much impossible to install on netbooks with Garfunkel storage. However, by using Virtual PC, Acronis true image and Vista PE, you can install Windows 7 OS on a device with as-low-as 2GB SSD. After installation, you will be left with mere 186MB of free space which may not enough for installing your apps. That said, it should be fun installing Windows 7 on a Celeron netbook released 2 years ago that came with with 512MB RAM and 2GB flash. Step 1: Vlite your windows 7 install, you need to make it as small as possible in order to get it to fit on the 2GB hdd, (and even then its too big. More details later about this.) Alternatively use a shrunken version of 7 with your own product key. There are lots of guides on how to Vlite your Windows 7 install so I will not cover them here. 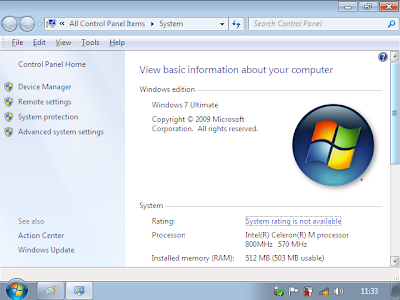 Normally the Windows 7 installation process requires much more than 2GB hard disk space available, making installing windows 7 on the 2g Surf impossible, so you have to do some crazy stuff with virtual machines in the next step in order to make it work. Step 2: Install Windows Virtual PC on an already working windows computer, take the iso you created in step 1 and install it to a Virtual PC with 512mb of ram and plenty of virtual hdd space. Step 3: Once you have the Windows 7 Virtual PC running, make sure that you have less than 2GB of space used. You need to disable your page file in order to shed the space, then reboot, you should hopefully be using less than 2GB of disk space now. Step 4: Now you need to have a copy of Acronis True Image, and make an image of your Virtual Windows 7 install from within the virtual environment. I created a secondary virtual hdd so I could backup the OS virtual disk to the secondary virtual disk, then boot back into windows and copy the TIB file (true image backup) over the network to restore onto my eeepc. Step 5: Now you need to use Acronis True Image to restore this image to your 2G Surf. 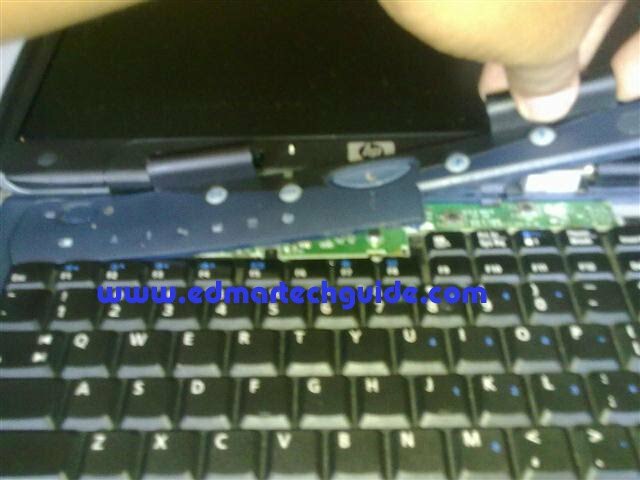 Restore the true image backup to your eeepc. Step 6: Now your eeepc has windows 7 restored to its 2GB ssd, but it will not boot.... it gives the error Status: 0xc000000f winload.exe error. How to fix this? Check the next step. Step 7: Grabbed a Windows Vista installation media (you can use the Windows 7 dvd as well) and booted into the install on my eeepc, and chose "Repair this computer" or something like that, then it will scan your drives find the installation that you restored and tell you that the startup is broken and that it can fix it. Go ahead and let it do its magic and reboot. Step 8: Windows 7 is actually booting on this tiny computer! 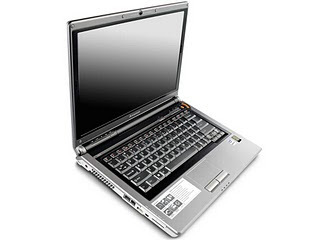 Let it load all the drivers it needs and reboot it again, you may need to do this several times, but you now have a fully functional eeepc 2g Surf running Windows 7! Reason: There are three entries of Upper and Lower Filters in the registry. The first entry is for the CD ROM. This is the only entry you will need to delete in order for your optical drive to work. The second and third entry is for the keyboard and mouse and you should not delete it or your mouse/keyboard will not work at the next restart. System Restore can do the trick but obviously you cannot do it because your keyboard and/or mouse is not working. You can try this method instead: Restart your computer and before the Windows XP logo shows, repeatedly press F8. Choose Last Known Good Configuration. Try this several times if it doesn't work the first time. Or if you're just like me (keyboard is working, mouse not), navigate through the registry and restore the deleted entries as shown in the screenshots above. If the above methods don't work. 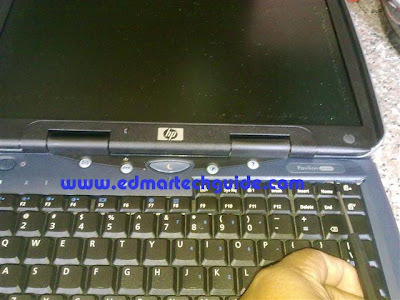 You will need to use a bootcd that is capable of navigating the registry. One example is UBCD4win. There will be several entries of these. Look for the keyboard and mouse entries (refer to screenshots above) and restore the upperfilters entry. An application that uses the Mfc80.dll module or the Mfc80u.dll module crashes after you install a product that updates the module version. 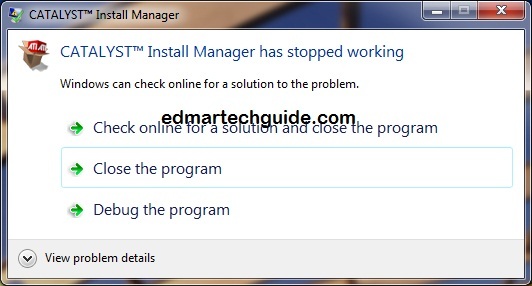 In most cases choosing "Check online for a solution and close the program" will solve the problem. If not, you can try downloading this Microsoft fix and install it. Then try to uninstall Catalyst again. 1. 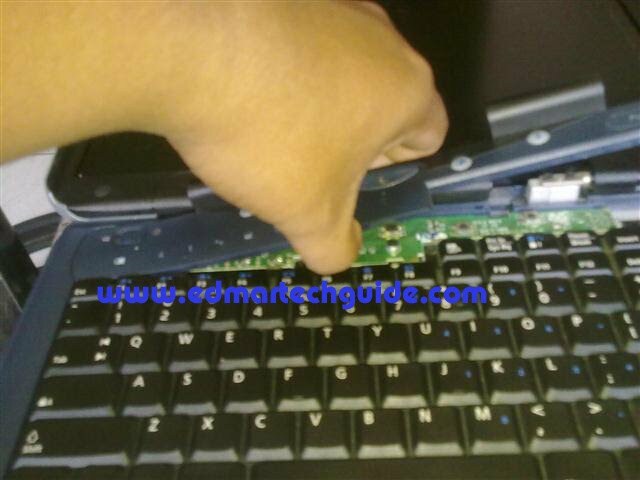 Unplug your laptop's AC adapted and remove the battery. 2. Remove the two (2) screws from the back panel located in the center of each hinge. 3. Open the LCD screen as far back at it goes. Use a small flat screwdriver to remove the top cover. 4. Unscrew the 4 screws that holds the keyboard and gently lift the keyboard. 5. Now you should see the hardrive sitting in the center. 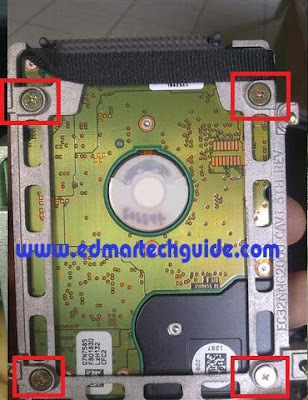 Remove the screws (4 of them) on each corner of the hard drive which connect it to the motherboard. 6. Gently lift or pull the hard drive by using the black ribbon at the top of the hard disk drive. 7. Once the hard drive is out, carefully remove the IDE connector that attached the hard disk drive to the motherboard. 8. 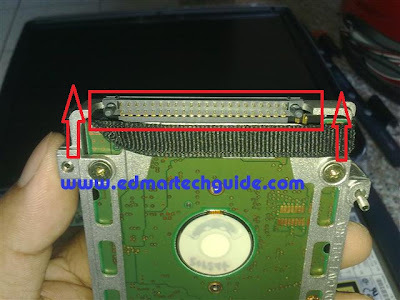 Turn the hard drive upside down and remove the 4 screws which connect the hard disk to its carrier. You can now replace the hard drive with a new one. 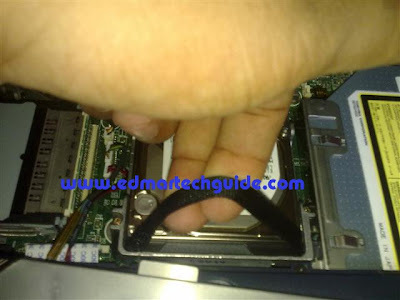 Remember that this laptop uses IDE type of hard disk drive, so be careful in finding a replacement. SATA drive will not fit/work in this one. 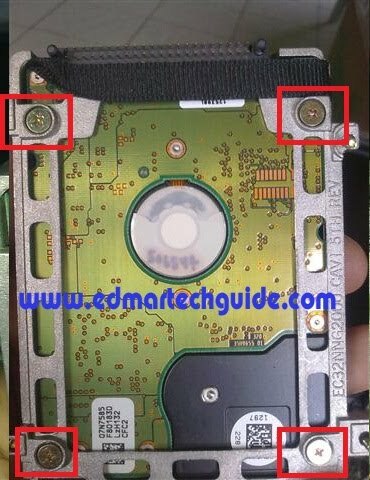 If you're replacing the CD/DVD Rom drive/writer, just remove the screw holding it in place and slide it all the way through. You will need to push the two clips at the top to be able to remove it. 2. 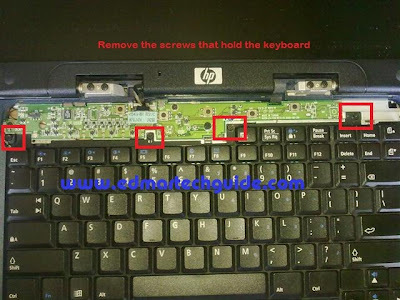 Unscrew the keyboard. There are two screws underneath the laptop that are holding the keyboard. See picture above. I encircle the two screws that you need to remove. 3. You can now remove the keyboard but be careful because there is a flex cable attached from the keyboard to the motherboard. 3. You can now remove the CMOS battery. It is the one wrapped in a yellow plastic. It is glued to the casing underneath so you will need extra force to remove it. You will also need to remove the wire connection. 4. Cut the yellow plastic to reveal the battery. 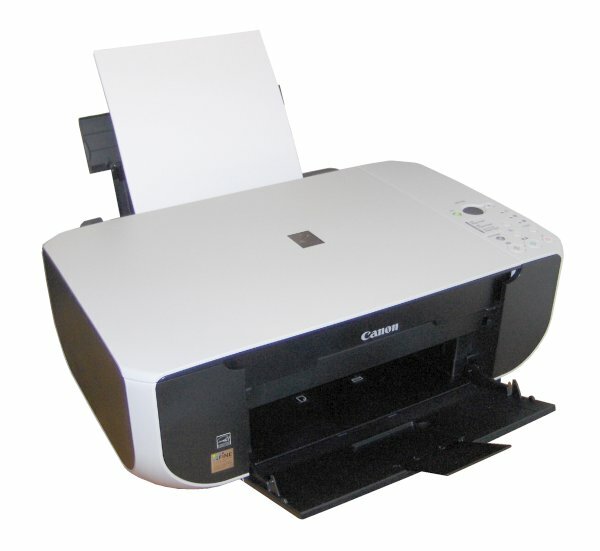 Change it with the same model (CR2032). 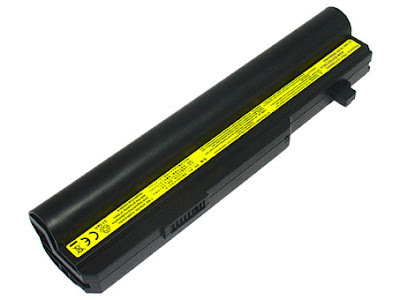 It is the same battery used in desktop motherboards. 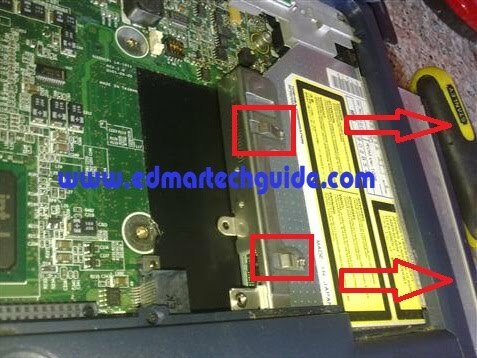 If you have spare motherboard lying around, you can safely use the battery from it provided that it is still holding charge. I use electrical tape to replace the yellow plastic thing. Error: The process cannot access the file because it is being used by another process. Downloading suddenly stops. There is a red X mark on the file that you are downloading. You see an error message that says "The process cannot access the file because it is being used by another process." 1. This error message is usually caused by indexing services of some applications/programs. Most common culprit are Google Desktop and Roxio Media. So if you are suddenly experiencing this problem, try closing Google Desktop or Roxio (whichever is present in your system). 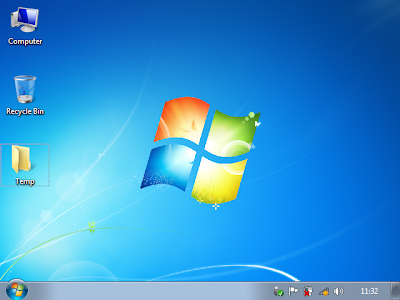 If you don't need these two programs, you can completely uninstall them. 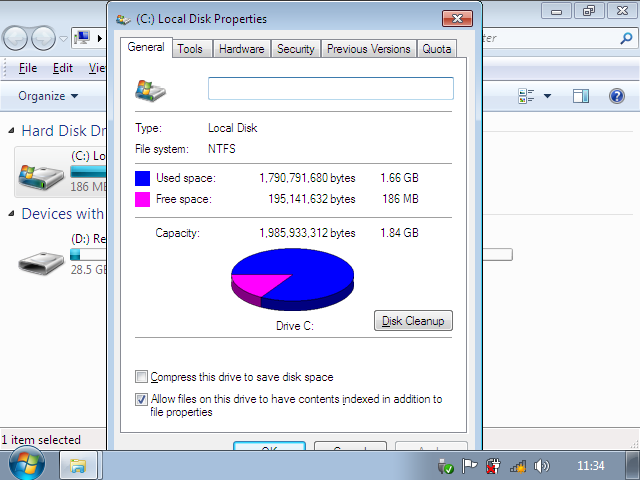 If that didn't work Select Options, Preferences then Advanced and uncheck "Disable Windows caching of disk writes". 3. 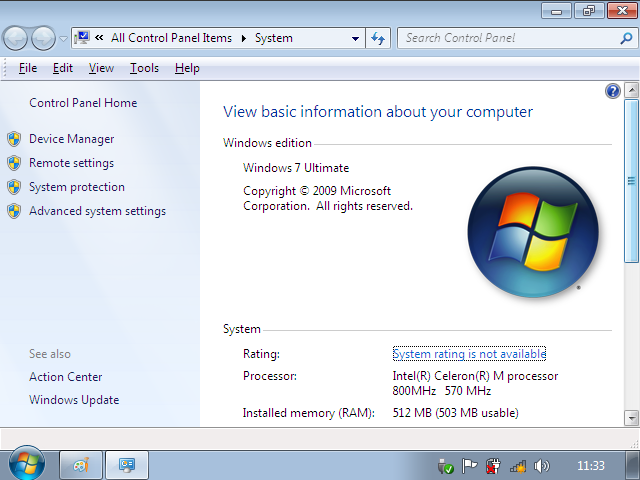 If you are running Windows Vista, disable the Indexing Service of Windows Search. 4. Try moving the downloaded files to another directory.